Orpheus, in Greek legend, was a musician and poet said to be able to charm all living and non-living things with his art. In this story, our protagonist is someone with the quixotic dream of becoming an Orpheus. He is a 70-year-old, esoteric avant-garde musician named Peter Els. A man who hears music in every vibration, who sees patterns in ordinary life. He’s had a fairly successful music career, but wants, as all serious artists do, to create something truly transcendent, transformative, a work of art that embeds itself into the fabric of humanity. And so he tinkers at home in his Internet-supplied genetics lab (he has taken up genetics as a hobby), where he works to encode music into the DNA of a strain of bacteria (theme: the virality of music/virality of ideas via digital transmission). His hobby soon attracts the unfavorable attention of the Department of Homeland Security, and in a fit of desperation, Els flees his home and goes on the lamb. He is quickly labeled the “Bioterrorist Bach” by the media and gains an instant and terrifying infamy. It is in this flight that Els recounts the most important relationships in his life, all failed to varying degrees, then attempts to reconnect with those people—a young girlfriend, his first wife, his daughter, his old theater partner. And it is through those reconnections that Els realizes that his opus is not the encoded bacteria but in his current performance—his flight. He finally has a grand audience that he can easily reach with modern social media. I have never read Richard Powers before, but this book blew me away. His intellect seems somewhere up there with David Foster Wallace, although that is just to say much smarter than myself (I listened to an NPR interview in which interviewer Michael Silverblatt asks Powers about a trip they took together years ago with their late friend David Foster Wallace to a think tank in Santa Fe where they listened to presentations on cellular biology—perhaps a seed for Orfeo). Apparently, Powers has been doing this for quite some time and I’m just late to the party. He has published eleven novels and won the National Book Award for The Echo Maker (ordered, in the mail), among a long list of other achievements. 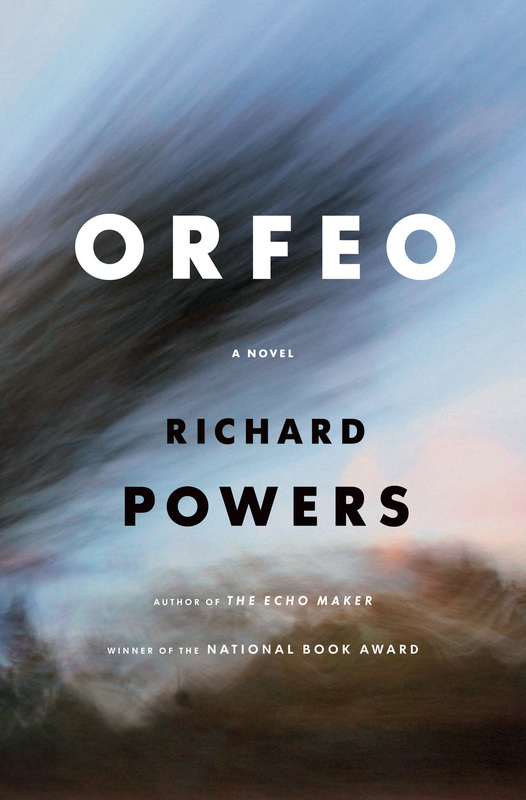 But despite his accolades, Powers has been criticized as being at times too ambitious and too intellectual, his novels sometimes lacking true human connection (in fact, perhaps in defense of this, the description of Orfeo on Amazon describes it as “his most emotionally charged novel to date”). I found none of this to be true of Orfeo. I thought the characterization of Els was thoughtful and believable, the relationships textured and realistic. And the marriage of ideas that Powers brings—apparently his strength across most of his works—is spectacular. The connection between music and cellular biology, the nexus of art and science, is stunning. Orfeo is a modern story, recalling Don DeLillo’s White Noise, set in our current paranoid state and our media culture. But the book is about the power of music (there’s a Spotify playlist called “Music in Richard Powers’s Orfeo” which has 467 songs in it) and, more broadly, it is about the nature of artistic endeavors. I think I’m sold on this one, will have to add it to the 600-odd books I still have to read!